OttoTHON participants dance it out during February’s event. For the second time this year, Syracuse University students will hit the dance floor to help children fighting cancer. OttoTHON will take place from noon to midnight on Saturday, Dec. 5, in the Goldstein Auditorium in the Schine Student Center. The 12-hour Children’s Miracle Network dance marathon raises funds for Upstate Golisano Children’s Hospital, located on the western border of the Syracuse University campus. Organizers expect more than 400 participants, says OttoTHON board member Tori Cedar. 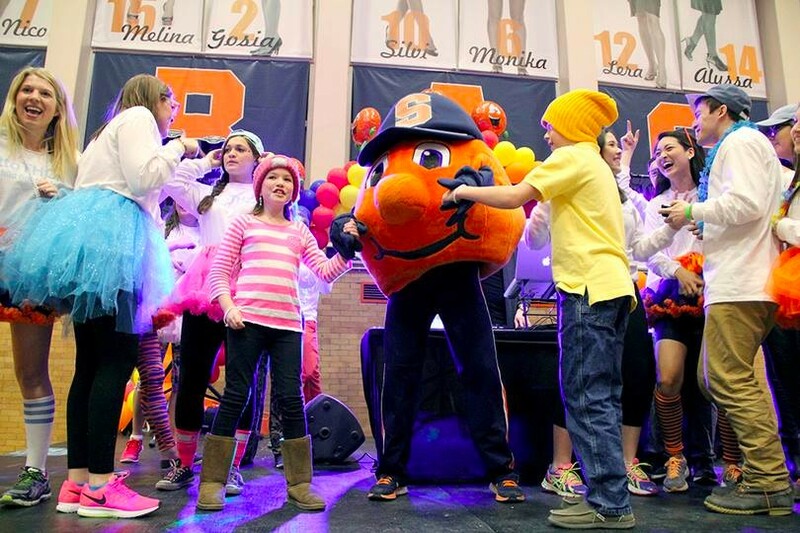 The first OttoTHON, held at Syracuse University Feb. 28-March 1, raised more than $84,000. Organizers hope to raise more than $100,000 at this event, says Cedar. OttoTHON will include a wide range of entertainment, such as Zumba, yoga, DJs, food, prizes, photobooths and more. Children and families from Upstate Golisano Children’s Hospital will also be in attendance to share their experience and as a reminder of the importance of the event’s mission and goal. Former Syracuse University football player and cancer survivor Rob Long will also attend and speak about his experience. For more information on OttoTHON, to register as an individual or a team, or to donate, visit http://www.OttoTHON.org. Every dancer has a minimum fundraising goal of $100 in order to attend the event. Over the past two decades, Dance Marathon as a program has raised more than $62 million for over 150 Children’s Miracle Network Hospitals across the nation. Funds raised by OttoTHON will all stay local to benefit children and families served by Upstate Golisano. Cedar, a sophomore in the College of Arts and Sciences, participated in OttoTHON last spring as a dancer, and is now working to organize the event as part of the all-volunteer, 24-member student executive board. The experience is well aligned with her majors in psychology and communication science and disorders. But the main reason she is involved, she says, is to make a difference in the lives of kids and families who are fighting for life. “We are dancing for these kids who can’t, and are fighting for the childhood they deserve to have,” Cedar says. “This is an amazing opportunity to work for the greater good.